It should come as no surprise to readers of this space that my life is loaded with Bluetooth devices. I love untethered audio, whether it’s music, a TV show or my favorite podcasts. But all those Bluetooth connections swirling around me are one-way conversations. In most cases it’s my mobile phone talking to a wireless speaker or headphones. When I heard about the Bluetooth Transmitter and Receiver Adapter from iClever, two features prompted me to request a sample to review. First, as the name states, this device can talk in two directions as it functions as either a transmitter or receiver. And second, it can bring the joys of wireless sound to a non-Bluetooth device such as the ancient portable stereo that I like to use in the back yard or my beloved Bose noise-cancelling headphones. 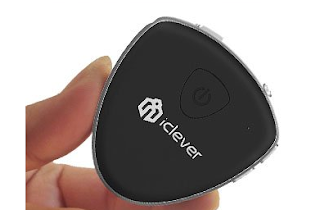 The iClever gadget looks like an oversized guitar pick. That’s a good thing when you want to slip it into a pocket, but not so great when you need to figure out which of its several buttons and switches to press for a perform a particular task. It’s powered by a rechargeable internal battery which can be refueled with an ordinary mini-USB cable and charger plug. And the large power button is easy to find on the front of the unit, just above the company logo. Like any Bluetooth device, the adapter has to be paired with whatever Bluetooth sibling you want it to talk to. There’s a tiny switch to move if you want it be in transmit or receive mode. Set the switch, then power up the adapter, find and press the Pairing button, get a little LED light flashing in the proper color and it makes nice with whatever nearby device is in pairing mode. No computer, app or code-entering is required. The adapter uses Bluetooth 4.1 technology, so that smoothes the way for connecting to a variety of wireless devices. It also supports aptX Low Latency, which should make it idea for use with a TV. I’ve tried cheap Bluetooth transmitters that don’t have that feature with my TV and the poorly-synced dialog drove me crazy. I tested the iClever adapter with a pair of powered speakers from an old computer and got high-quality sound for music transmitted from my mobile phone. It also worked just fine when I flipped the Rx/Tx switch and connected the adapter to my computer to get audio delivered to a pair of Bluetooth headphones. Along the way, I encountered a couple of minor annoyances. The first is a pairing issue. Once I had paired my wireless headphones with the adapter, I had to go through the pairing steps again to reconnect the my phone to the headphones. My other complaint is with the instructions that come with the adapter. Not so much then instructions themselves, but the fact that they are printed in teeny-tiny letters on pages no larger than a business card. I needed a magnifying glass to read the text. I don’t know if iClever is trying to save money or save the rain forest, but it made installation more difficult that it needed to be. Those issues aside, the iClever adapter did exactly what it says it would do - spread Bluetooth love and bring new life to old electronics. And I’m a fan of that kind of recycling. 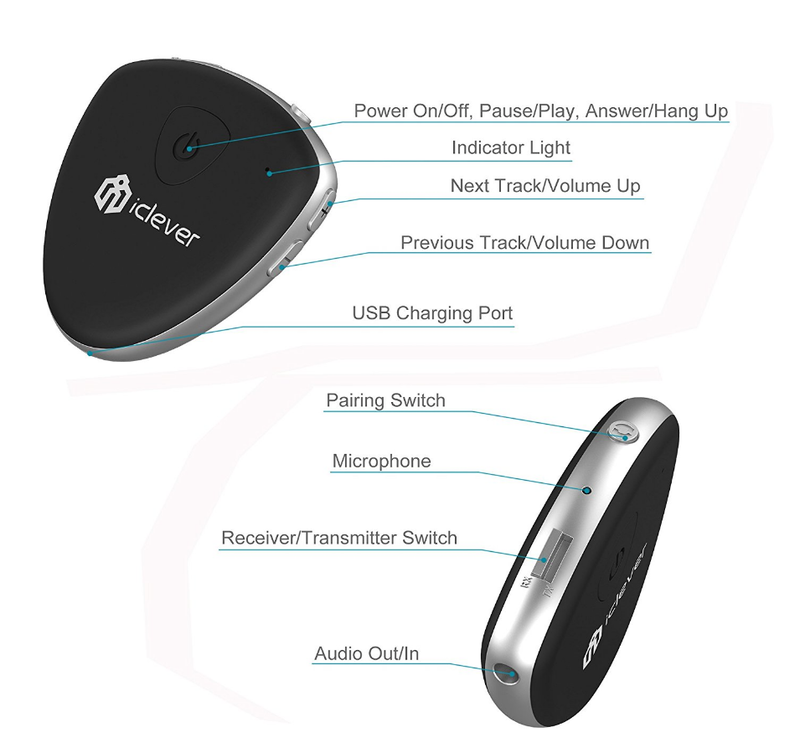 The iClever adapter , officially called the Bluetooth Transmitter and Receiver 2-in-1 Hands-free Adapter - sells for about $30 on Amazon.